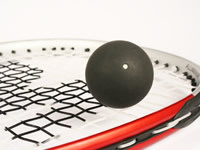 The effects of blood sugar levels from playing squash can vary, which may surprise some due to the intense nature of the sport. Many may expect blood sugar levels to fall during and following a squash match, but the predominance of upper limb movements and changes in body position results in relatively low energy expenditure. As a result, glucose use is also quite low, with glucose production subsequently higher which can lead to blood sugar levels rising during a game if not carefully managed. If you take medication that can cause hypos then managing your diabetes when playing squash can be tricky, especially if you are a first-time or very infrequent player. There are two factors worth considering before you play. The first is the adrenaline rush that arises from squash, which is much greater than other sports due to its rapid speed. This is another reason why glucose production from the liver is quite high. The second is that there is much less potential for hypoglycemia later in the evening, which will alleviate the need to reduce your quick acting insulin later in the day. With rising blood sugar posing a threat during the game, you will probably not need to dose up on carbohydrate or glucose drinks before you start. This is not to say that these items should not be on your person at all times though. If you are playing for the first time, it is best to eat and inject as normal before playing. You will then be able to gauge during and after the game how your blood sugar levels are affected. If you take tablets that can lead to hypos, such as sulphonylureas or glinides, you may find that a longer or more energetic session makes you more susceptible to hypos. Testing your blood glucose levels regularly - to check how your blood glucose levels respond - can allow you to take measures such as consuming carbohydrate if your sugar levels begin to drop below 5 mmol/l. This will prevent hypos from occurring. If your sugar levels drop too low when playing sports, speak with doctor about whether to lower your dose prior to playing squash. Squash is a notoriously tiring sport and you may struggle to recognise signs of high or low blood sugar. Medical identification must be worn should an emergency occur such as a hypo and people are trying to help you. You should also remember to take special care of your feet when playing squash, as blisters can easily develop if your trainers are not a comfortable fit. Playing regular squash will require consistent foot care. Wearing your insulin pump when playing squash should not cause you any problems, although it is not wise to attempt any dives to the ground that could damage your pump.